Carolina Motorsports Park is fairly young, by road course standards, having opening in 1999. Located on an old WWII fighter training base in the lovely state of South Carolina, the facility is home to the Palmetto Motorsports Club, which offers annual memberships for track day junkies with lots of perks. Between recreational and competitive automotive and kart events, CMP has something going on year-round. The racing line at at Carolina Motorsports Park begins with a straightfoward section of the connected Turns 1-3. After exiting Turn 4, make sure to keep enough speed to carry yourself all the way to the outside between 5 and 6. Al has the Miata with the pedal to the metal from the Apex of 5 through the end of the back straight, but that will be impossible without the perfect line and sticky tires. Turn 6 is a fool's apex, but it's important for most vehicles to scrub off just a bit of speed in order to tighten the line leading into Turn 7. Otherwise, you can miss the apex at 7 and sacrifice speed down the back straight, and nobody wants that! Turn 9 is just a bend that can be taken flat out by everybody, even on street tires. 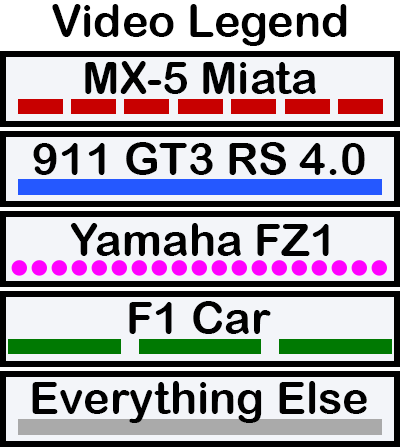 Only the Miata is going to have the pedal down through Turn 10. The section of Turns 11-13 is where we see the biggest discrepancy between many drivers and the optimal path. Most pilots opt for a wide entry and late turn-in at 11, when instead they should turn in earlier and stick to the inside. Turn 12 comes up quickly, and requires entering from the far left, so only the Miata exits 11 at all wide. Even then, a wide exit should not be favored over getting all the way left to set up for 12. A similar approach is taken for Turn 12, where it's quickest to hug the inside all the way through Turn 13. All vehicles should minimize distance by hitting the apex at 13, but some of the higher powered vehicles in the clips below run wide of the apex in an attempt to maximize speed. Because braking for Turn 14 comes soon after exiting 13, this approach does not provide any benefit, but can certainly be used as an alternative as the difference between the approaches is very negligible. Since Turn 14 is a tight, greater-than-90 degree corner leading out onto the front straight, it's a prime location for spinouts in higher powered vehicles. Stay smooth and carry enough speed through the apex. Then enjoy a few seconds of relaxation down the straight before gearing up once again for Turn 1! This is supposed to be a track day but I don't see any other drivers. Not that I'm complaining, since the lack of distractions makes this video a nice introduction to the track. The lines are pretty good, including coming deep out of Turn 5. The major problem area is the 11-13 section, where this driver could benefit from hugging the inside and worrying less about catching late apexes. Here's a cool clip of a competition at Carolina Motorsports. When the lines aren't disturbed by the racing action, this video is generally the closest demonstration of Al's line. Lap times look to be around 1'40 in this clip. Steve gets the same advice as the other pilots regarding Turns 11, although he does well staying outside setting up for 12, and the line through 13 is very good as well. Some high quality driving from Cory in this video - too bad about the spinout! An important difference from the other videos is how he tracks all the way to the outside following Turn 5, then scrubs off enough speed to get the car pointed all the way back in to the apex at 7. Also note how close to the inside he stays through both Turns 11 and 12. Cory drifts to the outside through Turn 13 in order to maximize speed down the short straight preceding 14, but it might be quicker to stick the inside instead. CarnageR1 takes us onboard for some fast laps around CMP. This rider could exit deeper out of Turn 5 to set up better for the back straight. I also see a wide entry / late apex approach in Turn 11, which is not recommended for any of the vehicle types. The approach through 13 is pretty good, with most of the bikes in this video keeping to the inside following Turn 12.